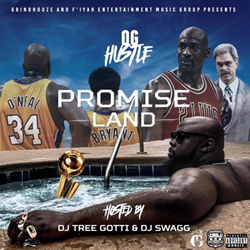 D.C. Recording Artist OG Hustle Releases New Mixtape "Promise Land"
Coast 2 Coast Mixtapes announces the release of the new mixtape by OG Hustle currently seeking blog placements and interviews. Today Coast 2 Coast Mixtapes announces the release of "Promise Land”, the latest mixtape by D.C. recording artist, OG Hustle . The mixtape is currently available for streaming and download at the Coast 2 Coast Mixtapes website. OG Hustle is a native of the Southeast region of Washington, D.C.. It was there that he learned the meaning of what a true hustler is. Straight from the streets and through hard work and dedication of spending late nights in the studio with his equally talented producer brother DJ Tree Gotti, a master lyricist was born. OG Hustle and DJ Tree Gotti created a sound and a stage presence that is unique and captivates the audiences whenever they take the stage. OG Hustle and Tree Gotti gave birth to the hit factory based out of Southern Maryland called Grindhouze Inc. where he serves alongside of his brother as CEO. OG Hustle has worked with some of the industries rising stars and recently performed with Young Thug in Columbus Ohio on the Slime Season tour. OG Hustles also adds to his repertoire of performances with artists such as Fat Trel, Ant Glizzy, Lil Durk, and Skippa the Flippa from the Migos to name a few. OG Hustle dropped his debut single Surprise that is available on iTunes, Google Play, World Star and was distributed by Sony Red. Up now from OG Hustle is his debut mixtape "Promise Land". OG Hustle is currently seeking press opportunities, interviews, features, and more. He can be reached through his official Twitter page. About OG Hustle: OG Hustle was raised in Southeast D.C. It was there that he gained the knowledge of a true hustler. Through hard work and dedication of late nights in the studio, OG Hustle and DJ Tree Gotti created a sound that will separate them from others in the music industry. OG hustle and Tree Gotti would later birth a hit factory based out of Southern Maryland, called Grindhouze. OG Hustle and his brother DJ Tree Gotti are the CEO's of Grindhouze Inc. OG Hustle has worked with some of the industries rising stars. OG has recently performed with Young Thug in Columbus Ohio on the Slime Season tour. OG has also worked with Fat Trel, Ant Glizzy, Lil Durk, and Skippa the Flippa from the Migos etc. OG Hustle dropped his debut single Surprise that's available worldwide, iTunes, google play, etc. with distribution through Sony Red. Be on the lookout for OG Hustle's Sophomore single Hold up I'm Flexin dropping worldwide distributed by Grindhouze Inc.